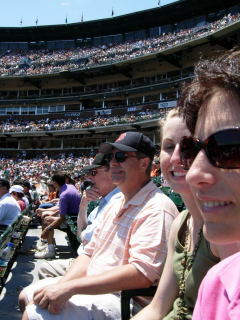 Yesterday, Sunday, one of the hottest days EVER, Burt and I went to watch the Giants play the San Diego Padres. We were taking friends from Boston (HUGE Red Sox fans) to see the new (for them) ball park and we didn’t know it was going to be a boiling cauldron–we bought the tickets a while back. As anyone who has lived in northern California knows, July is traditionally a foggy month for us–and especially for those of us who grew up in the mild climates of San Francisco and the Coastside, hot hot hot weather is something we just don’t know. As we left the Coastside (via good old Hwy 92) to pick up our friends in San Francisco, we couldn’t help feeling sorry for the endless line of cars heading for the “cooler” Coastside. And the line WAS endless–at about 10 a.m.
Why do people stand in lines of cars, in overheated cars, on the hottest days of the year, sometimes for hours–why do they jam Highway 92 when people could have gone to Pacifica where Rockaway Beach is delightful? Why? Why? Why? It’s fair for you, the reader, to ask why Burt and I went to the ball game on the hottest day of the year…If the hottest day ever ever returns, Burt and I won’t go the ball game again. We think, we hope, we learned….. It was so hot at ATT&T Park in the City that by the 3rd inning we retreated into the cool of the building where we found seats in the restaurant and were revived by several lemonades. Later, a very nice usher appeared with a spray bottle filled with water–and he spritzed anyone who asked. Thank you, usher. I got several spritzes. I had turned lobster red. Burt was feeling shakey. Our friends from Boston were more familiar with heat than we were and they didn’t have to leave their seats (also blazing hot to the touch but they complained a lot. But–as usual I had my eye out for “stars”–and I wasn’t disappointed. 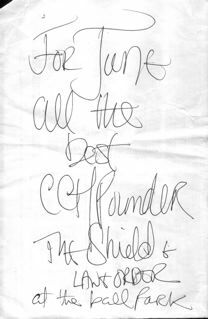 Seated directly across from us in the restaurant was CCH Pounder, a favorite actor from The Shield, the daringly different cop show on the FX channel. You know me–I couldn’t resist. She was everything a star should be. Composed, gracious and very attractive. I not only got an autograph but two photos, one with me and my lobster red face (I won’t show you that one).